Loan writedowns and bad debts, plus a lasting hangover from the financial crisis mean Italy’s banks are on the edge of a precipice. Provisions to cover liabilities on “unlikely to pay” and past due debt are less than half of those set aside for bad debt, limiting the freedom of the banks to get fresh credit on the markets. Structural reforms are the prime asset of Italy's future. I think that's something everybody has always said, everywhere. However ECB boss Mario Draghi insists the debt level is sustainable. “The euro area economy continues to expand at a moderate but steady pace, despite the adverse effects of global economic and political uncertainty. This gradual upward trend is expected to continue, not least owing to our monetary policy measures,” he said. The situation could tilt into crisis if the December 4th constitutional reform referendum leads to the fall of the Renzi government. Then any calls for fresh capital, of which the banks need an estimated 20 billion euros in the coming months, could fall on deaf ears. Only one bank, Unicredit, with foreign assets, is thought to able to weather any market storm. “To the financial markets we say that we have always received the message that structural reforms are the prime asset of Italy’s future. I think that’s something everybody has always said, everywhere. And we think that structural reforms is what the country needs,” said Prime Minister Matteo Renzi. 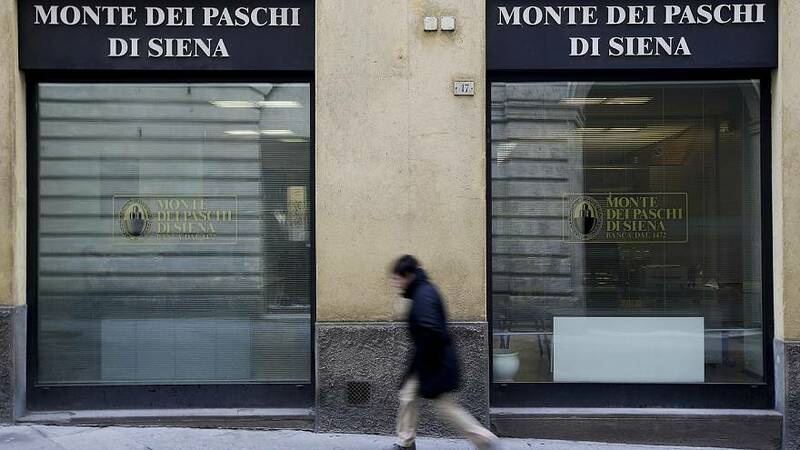 Italy’s third-biggest bank, Monte dei Paschi di Siena is Europe’s most distressed lender and could be the first to fail. It needs five billion euros of new capital and warns it may have to go out of business if it does not get it. Seven other regional banks are also in serious trouble. Italy’s sovereign debt is another separate headache which the government is struggling to fix with the EU urging action lest a new euro crisis is triggered. On Tuesday an investor survey by Frankfurt-based Sentix rated Italy’s chances of leaving the eurozone in the next 12 months at 19.3%, the highest since the index began in 2012, and worse than Greece.